The Emperor is gifted with the skills to successfully lead others. He can turn chaos into order, provide structure to that which is unbound. He is quick of mind and confident in his power and right to rule, and does so in a just manner. Although stern by nature, he truly is the ultimate father figure. He will provide as needed, teach those with unanswered questions, protect the vulnerable, set and maintain boundaries. When The Hierophant or Justice are among your personal cards, the influence of The Emperor may be increased. 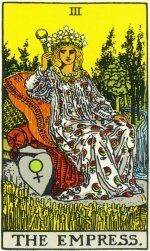 Having The Empress in your personal cards may diminish the influence of The Emperor.